At times, imparting smoke into dishes requires us to take a step or two back to revisit the entire concept. 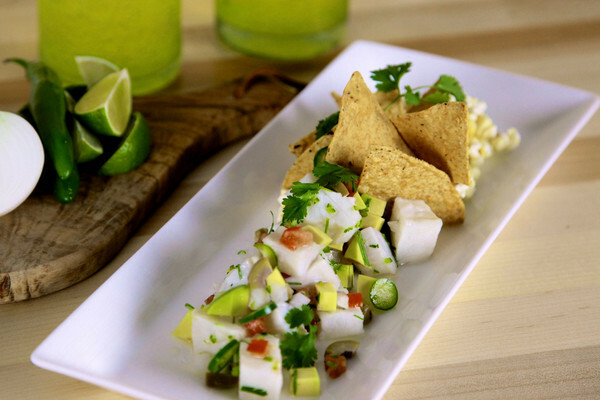 With this smoked ceviche, the smoked lime juice carries the flavor through the fish, not just around it. Reimagine any marinated dish and surprise your guests with every smoky bite. In a high speed blender or covered container, smoke the lime juice with the PolyScience Smoking Gun™ for 5 minutes. Blend or whisk aggressively to incorporate smoke and lime juice. In a medium glass or stainless steel bowl, combine the fish, smoked lime juice and onion. Cover the fish with enough juice that it floats freely. Cover and refrigerate for 2-4 hours. “Cooked” fish will be opaque and no longer looks raw throughout. Gently drain in a colander. In a large bowl, mix together the tomatoes, serrano chiles, cilantro, olives and optional olive oil. Stir in the fish and season with salt. Add the orange juice. Cover and refrigerate if not serving immediately. Just before serving, gently stir in the diced avocado. Garnish and serve with tostadas, tortilla chips or popcorn. It is traditional in many places to serve ceviche with popcorn.